As Donald Trump denies that he told the widow of a U.S. soldier killed in Niger that her husband “knew what he signed up for,” today’s guest is Khizr Khan, whose son was killed in Iraq in 2004. Khan famously spoke out against Trump at last year’s Democratic National Convention and continues to do so. 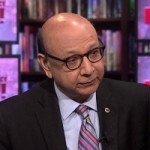 Khizr Khan, one of the country’s best-known Gold Star family members, reflects on the war that took his son Humayun’s life, the 2003 Iraq War. Capt. Humayun Khan died while fending off a suicide bomber outside the gate of his troop’s Army compound.